Cat Chat With Caren And Cody: Meet The "Cat Door"!!!! Hi everyone! It's Cody and boy oh boy am I ever happy to tell you about a FANTASTIC and super affordable product (it costs only $19.95! !+shipping) that Mom and I have! It's called the Cat Door!! I am not just meowing Dixie when I tell ya that Mom and I LOVE IT! Mom was contacted a few weeks ago from a fellow Michigander and super nice guy, Jim Owens, who was telling her about the Cat Door. 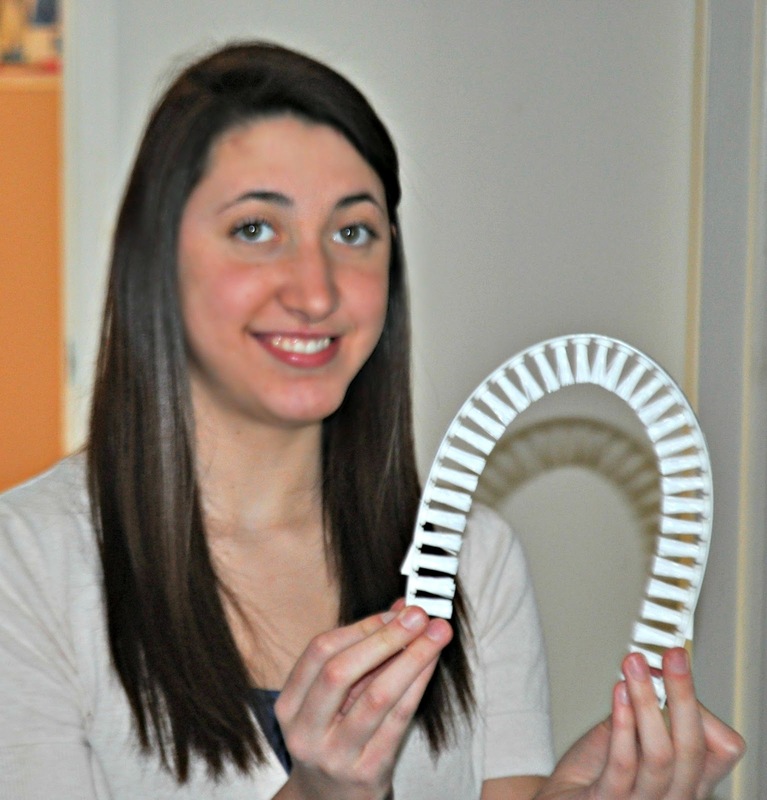 The Cat Door Company is virtually run by Jim's granddaughter, Meghan. Meghan is still in High School and handles all of the responsibilities of the company! How AMAZING is THAT!!?? Meghan hopes to use any profit that is made by her company to pay for her college education. That alone makes this product even cooler!! 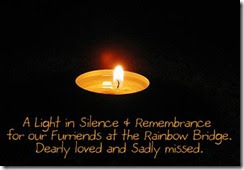 When Mom heard from Jim it was like an answer to her both of our prayers! 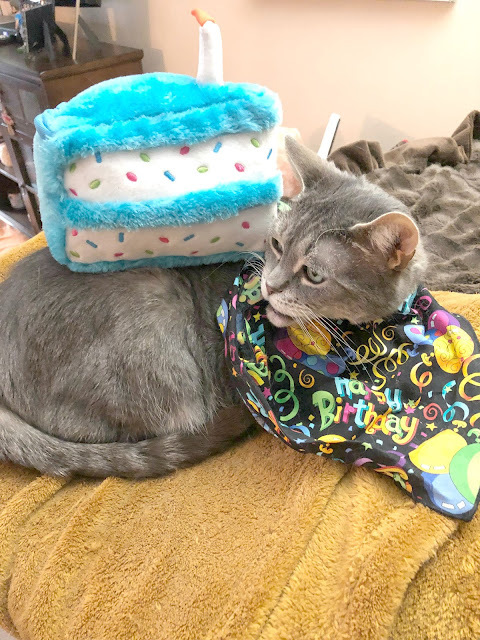 You see, just days before, Mom was trying to get some work done in her our office, but couldn't concentrate due to the incessant barking of a certain someone who shall remain nameless, it was Dakota if you MUST know, surprise, surprise! Mom got up and shut slammed her door to OUR office shut. That worked to block out some noise, but guess who else it blocked? ME! I scratched and whined at the door. I had work to be done! I must supervise all of the activities on our blog! Mom MUST NOT be left to her own devices! I must have full access to OUR office at all times! We had a problem. Then it was Jim who came to our rescue! 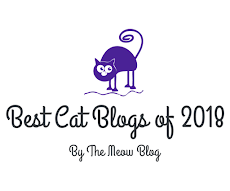 He told us that the Cat Door would be a great solution to not only our problem, but the problems that all of you might face, be it needing a place to hide the litter box, to keeping larger annoying pets away from us, to keeping little humans away from our toys, etc. The Cat Door can be installed in a basement door, laundry room door, even a closet door! Mom's ears perked up! She HAD to test this door! Since Jim is from Michigan he was kind enough to offer to come over and install our door for us! 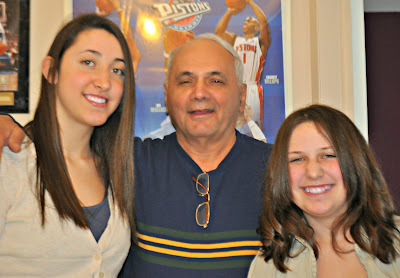 He brought along his two incredibly sweet, kind and patient granddaughters and the fun began! Mom and I were impressed that the installation was a BREEZE!! Anyone can install the Cat Door! Make that anyone except my mechanically challenged mother and father, but I digress. The Cat Door comes with all instructions and all of the fasteners that are needed. If you want to see a complete demo of the installation process, instructions and template you can click here. The Cat Door arch frames are super attractive too! They are made in the USA and are made of durable ABS plastic and have a matte-white finish. If you would like a wood frame there is another model called The Cat Hole (it costs a little bit more than the Cat Door and is sold by Meghan's Grandfather, Jim) you can read about that here. Once the Cat Door was installed, ( it even has a little grooming brush so I can have a little massage as I enter!) 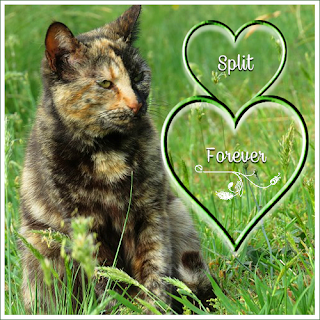 The grooming brush will pick up loose cat fur and it is replaceable and is able to be easily cleaned. That was all well and good, but the question of the day was, Would I use the Cat Door? They seemed to have forgotten they were questioning the amazing abilities of a supremely intellectually gifted cat, namely ME! OF COURSE I USED IT! More importantly I LOVE IT! My Mom loves it too! Now we can block out "Bob Barker" in the other room and Mom can still let me, her favorite, enter any time that I want! The Cat Door also functions as a super addition to my arsenal for teasing my Sheltie brother! I can watch him through the Cat Door and show just enough of my face to drive him insane! That makes for HOURS of fun! Speaking of FUN, check out this video! The video below is a family labor-of-love. The song is sung by Jim and his wife, their little cousin Daniel is in the video, Jim's piano teacher is playing the piano in the video and the video was narrated by, Dave Gebauer. The cat in the video even looks a little like ME only I'm cuter. 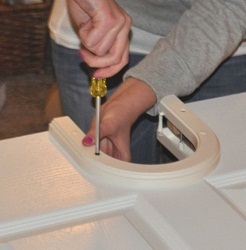 Mom, Dad and I had a super great time when Jim, Meghan and Makaylah came over to install my catabulous new Cat Door! Mom and I don't often get to meet the people behind the products we feature on our blog in pawson, and that helped to make it EXTRA SPECIAL!! They were all so nice and super considerate too!! Mom and I were happy to make some new friends! 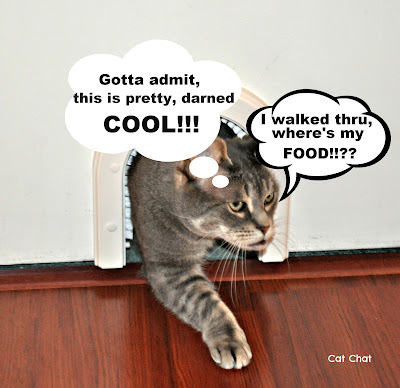 If you would like to purchase a Cat Door (and I KNOW you would like to!) you may purchase one online via PayPal. Don't have a PayPal account? No Problem! PayPal will allow you to use almost any credit card! Thanks again to Jim, Meghan and Makaylah! Thank you for our CAT DOOR and for installing it too! We couldn't be happier!! That is SO cool! I've always thought it would be so nice to have a tiny entry into a room for the litterbox! And look! Here it is! What an ingenious idea... Way to go, Jim and Meghan! ....love the little brushes. Looks like a mini cat car wash! so pawsome! we'd like that for our closet doors - then mom wouldn't need to leave them cracked open for us! Thanks for sharing! That is one COOL cat door ! Very COOL that Meghan , Jim and Makaylah came to your place and put it in too ! We love this especially the brush. We will try to convince our human to install a brush to our 'meowse hole'. Purrs! We love that you get brushed as you go through it! Yay!! @Marg thank you soooo much!! It truly is! It is working like a champ! @The Chair Speaks the brush is ingenious!!! @Priscilla lol!! Dakota's door is the FRONT door! lmao!! @Kjelle we loved having them here as well and it was super nice of them! We love the Cat Door! @Cara n Crew yep that is perfect for your closet door so you don't have to have it left open for you! Your own secret passageway! I think this is a fantastic idea! When we bought our house the previous owners had actually cut off the bottom of one of the doors so the cat had access to his litter box! 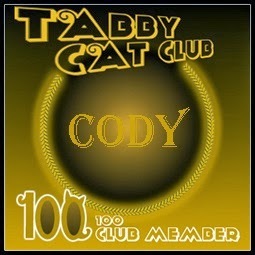 Cody must love it! that Meghan sounds like one smart cookie! Great post! Guess what? We have seasons tickets too! hee!hee! @Carolyn you never know! I wasn't sure about Cody either but he runs through it like a champ! I also love the affordability aspect and it is adorable! 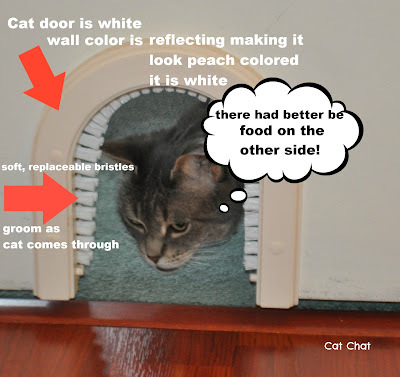 I've become intrigued with the indoor use of cat doors (as you'll see in my post scheduled for tomorrow - once again, Caren, it looks like "great minds think alike!) and this one looks like really nice and attractive looking option. I love the addition of the grooming brush! That is cute. Lucky kitties. Hopefully a raccoon doesn't squeeze inside! FYI. I'm finally reading about Zee and Zoey. I must say, that is pretty darn cool! Is your door also a PORTAL? Can you use it like a tunnel and come through and visits ME! Or does mes has to get a door too sos we can teleport to each other? Waiting in anticipation of your arrival - um Thursday when I get back from Hollywood. What a fab idea! Can you use it to visit us in our garden? We think every door in the world needs one of these. SRSLY. @cat from hell all you need is a closet to zip about thats what we bunnies use a magic closet.From Speedy! Great cat door!!!!!!! We love it!!!!!!! Mommy would love to install a cat door in the bedroom so we can have easy access but Daddy would be very unhappy. PS/ The package has arrived! We'll be blogging about it very soon. Thank you so much! Pretty cool cat door. And I love that Meghan came up with such a neat idea as a way to finance her college education. I'd say she has a bright future ahead of her! @Linda I couldn't agree more! @The Furries maybe we can convince your Daddy? It is a GREAT DOOR! So glad that the package arrived safe and sound! @speedyrabbit, a "magic closet?" Do tell! @Brian we think so too! @Sharon Wagner it's inside so no raccoon!! Yay! You will love Zee & Zoey! @Ingrid King oh my!! Too funny!!!! I love it! Yes the brush is a nice addition and what I really love is that for INDOOR use this is a much more AFFORDABLE option than some others on the market. For indoor use this is perfect! That is soooo classier than OUR entry door to our bathroom, we may have to trade up! Daddy freaked Allie out by putting up a Men's Room sign over our door, mebbe she should have one of her own! That is a pretty cool door. We know a certain someone (Mica!) who really doesn't like closed doors and who likes to be brushed! We'e sure she'd love that little door. How cool! 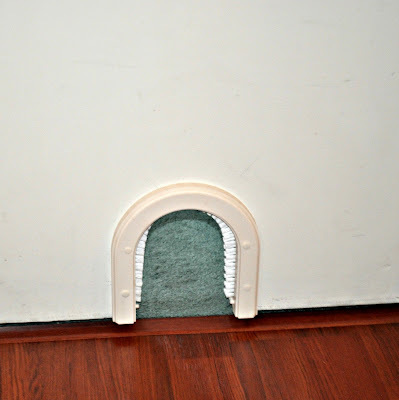 We can use this cat door for the closet as we sometimes close the door not knowing my boys are in it! How incredible Meghan is. I hope she earns enough to pay for college! FYI,there is a pic of Cody at the birthday party. OH I totally LOVE that door. I thought that was lace around it till I read about the bristles. MOL. @Katie...LACE!!! What a wonderful idea for the lady cats!!! I love it!!! @Layla I was there early this morning! 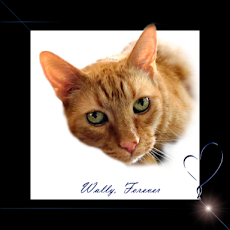 I am bummed though cause I made you a special birthday pic but that is ok! @Tamago what a great idea! That happened to my Angel Bobo once. He was accidentally shut into the closet years ago. He was there for HOURS (because I was at work)...that is something that could be avoided with this. @Oui Oui that sounds PURRFECT! @Rykers "Men's Room" OMC too funny! You guys are all so hilarious! Ooo I want one! We are always trying to figure out how to keep the dogs away from the food and litter boxes. That currently involves using a big bulky gate and letting the cats jump over it lol.